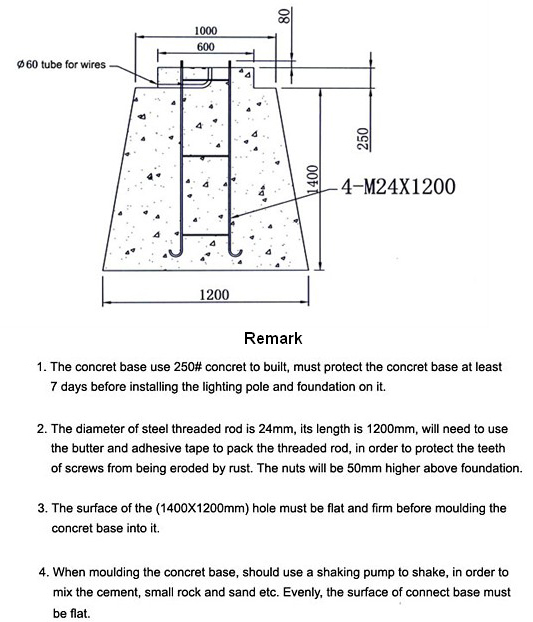 1) Please install the 12V 400Watt wind turbine in advanced. 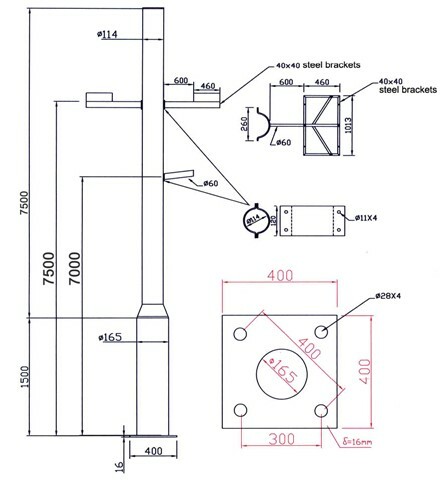 (Please manual instruction of Wind turbine) And please connect the wind turbine wires to the wind turbine controller. 3) Please check power cable inside of the lamp post to distinguish the polarity of which end is positive and which end is negative. Then connect the cable wires to correct polarity of the solar panel first. 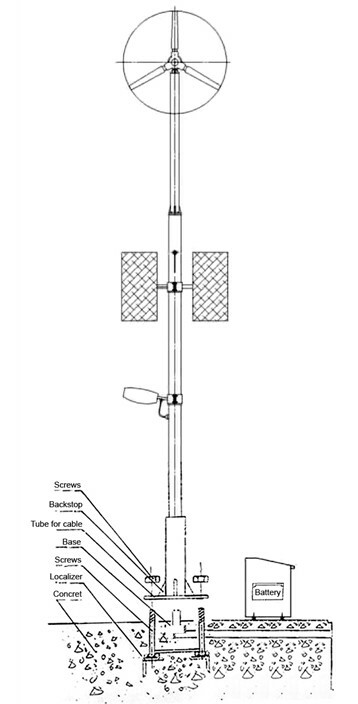 7) Install the 12V LED600*2pcs on the arm of the lighting pole and connect the relative wires. 8/) Please connect the wires to the battery from the controller, also connect the wires to the 12V LED600*2pcs lighting fixture from the controller; please note the polarity of “+” and “-“ ; Please lead out the sensor from the controller to attach near the ventilation hole of the battery casing. 9) After finish all the connection of cable wires, please adjust use the black color cloth or black color paper to cover the sensor to check if the whole system working or not by panel working. 10) When the whole system is working, please adjust the sensor to attach correct ventilation hole position of the battery casing, hence the sensor can sense intensity of outside ambient brightness, difference brightness will cause the sensor working on early or later during evening is coming, also the sensor will be effected by the car light, so we cannot put the sensor toward the car light can reach..
1) When the wind turbine and solar panel is working, do not do the installation job. If you want to do this, we suggest you use some black color cloth to cover the panel to do the installation job. 2) Please attach the sensor to attach near the ventilation hole of the battery casing. But please do the testing at night to see if other car light or street light can cause the sensor so sensitive, if the lamp flash on-off from time to time, that means the position of sensor in correct. Please put the sensor in the correct position of the battery casing that other car light and street light can not reach to. 3) If for wrong connection diagram will cause the central controller fail, so please note the polarity. 2. 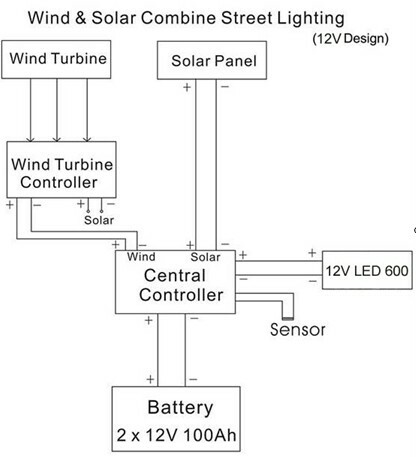 Drawing of Wind & Solar Street Lighting. 3. 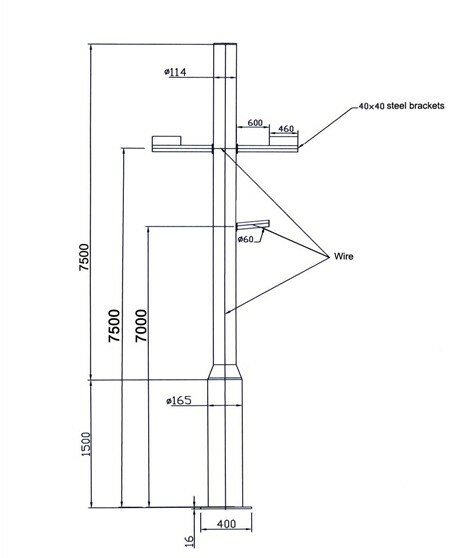 Drawing of Hybrid Solar &Wind Street Light Wire Connection.